So, technology is so cool. There’s now a roller coaster in Sea World, Orlando, that has revamped a ride… with virtual reality. An article has a video included, and it looks pretty fantastic. With the VR element, the ride turns into an underwater thriller thing. This entry was posted in real world, Webmaster and tagged real world, webmaster on June 30, 2017 by Webmaster. The Return of Boaty McBoatface! So, I’m happy to report that the scientific craft named Boaty McBoatface has safely returned from its first mission. There’s an article about it and everything. This entry was posted in real world, Webmaster and tagged real world, webmaster on June 29, 2017 by Webmaster. Epic Music for the mid-week slump. Or just because. Somehow or another, I found a very interestingly named album on YouTube. Despite the weird names, though, the music is fantastic. I enjoy it a lot. This entry was posted in music, Webmaster and tagged music, webmaster on June 28, 2017 by Webmaster. This entry was posted in Webmaster and tagged webmaster on June 27, 2017 by Webmaster. One of the very popular artists on YouTube, Peter Hollens, created a Disney Villains music medley. Normally, I am not a fan of his solo style. (His work feels “draggy” to me. It is a popular style, but one I am not overly fond of.) However, this one works well, especially as his collaborator is quite enjoyable. Also, the Disney Villain songs are pretty decent. This entry was posted in fluffy, YouTube and tagged Fluffy, youtube on June 26, 2017 by Fluffy McGiggles. 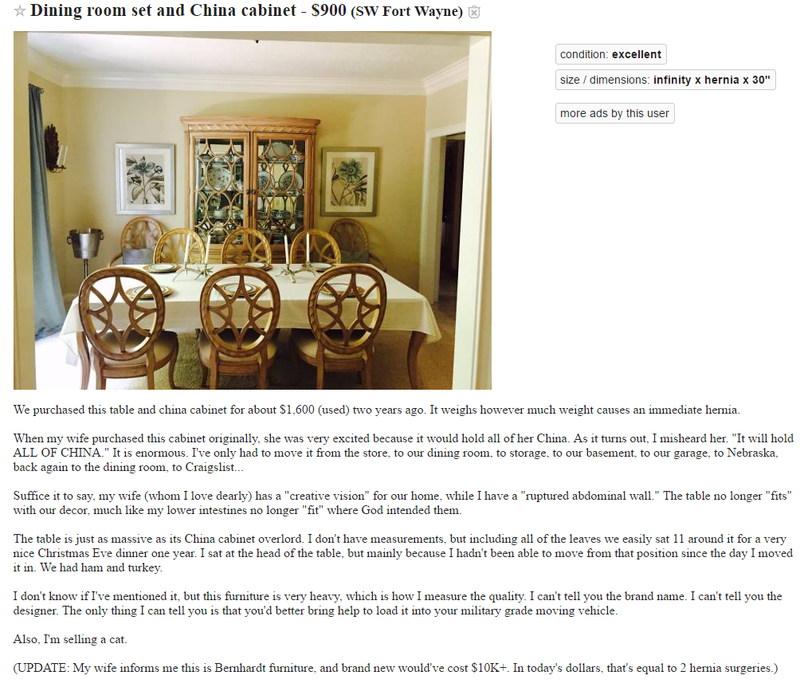 Somebody recently shared a Craigslist ad for a furniture set. And the person who wrote the ad did a fun job with it. If you want to read the original, you can, but I’m also including a screenshot. So, enjoy! And happy Sunday! This entry was posted in Webmaster and tagged webmaster on June 25, 2017 by Webmaster. I recently encountered an astonishing Facebook video. A musician composed a song in ten minutes, with a live orchestra. It is well worth watching. Enjoy. This entry was posted in fluffy, music and tagged Fluffy, music on June 24, 2017 by Fluffy McGiggles. So, take a look! I was surprised at the fact that I liked the vid. You might too! This entry was posted in Webmaster, YouTube and tagged webmaster, youtube on June 23, 2017 by Webmaster. As you are aware, the Webmaster and I usually keep this website politics free. However, I recently encountered a website that I believe still works. For, you see, it is a “political ideology generator.” You can click the button, and see what type of ideology you get. My favorite so far is the Marxian Anarcho-Capitalist. This entry was posted in fluffy and tagged Fluffy on June 22, 2017 by Fluffy McGiggles. So, I found a very short video of the adorable dog I mentioned yesterday giving a high five. This entry was posted in ANIMALS!, Webmaster and tagged animals, webmaster on June 21, 2017 by Webmaster.